The Second World War brought many changes to the lives of Canadian children. With fathers and brothers being deployed in the battle overseas, mothers suddenly joining the work force, shortages of food, rations, and talk of Nazi spies and Japanese invasion, the echoes of war were ubiquitous in the lives of children (Cook). Undoubtedly troubling for them, one of the only offers of escape for children was comic books. Enter the “Canadian Whites”: a series of comic books created by Canadian publishing companies that filled the void left by the removal of the American popular media when the King administration passed the War Exchange Conservation Act (WECA) (Bell). The “Whites” lifespan was short, but nonetheless, their run fulfilled a significant role in the lives of Canadian children. In this article, I will examine issue no. 17 of Wow Comics (a member of the “Whites” family), in particular the narratives that focus on themes of war and violence, and how those narratives quite paradoxically supply readers with a more optimistic outlook on the war they were living through. By selling children a world of clear-cut narratives to situate themselves in, where good and evil were easily distinguished, the heroes always won, and life at home was never shown as being in danger, Wow Comics perhaps served as a means of upholding morale in their lives. For the purposes of this article, I will be using the term “morale” as a measure of optimism held by Canadian children about the war. Advertisements, propaganda, and other products of pop culture (including comics) that work to improve or positively shape consumer’s outlook on the war effort can be seen as upholding morale. Additionally, anything that helped kids to orient themselves in the confusion of wartime, or provide some sense of comfort and security can also be seen as upholding morale. Figure 1. Government issued propaganda used Hitler’s image to discourage spending. H. V. Shaw (a). 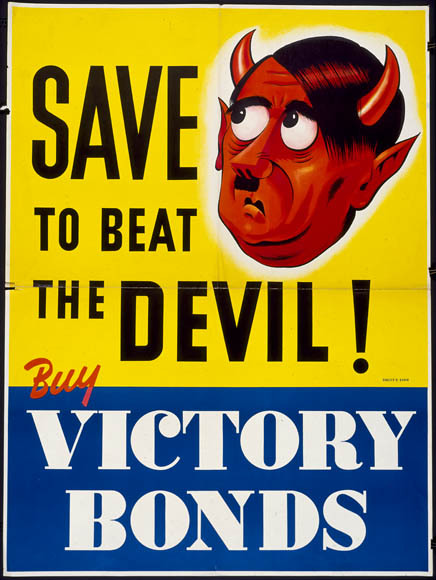 “Save to beat the devil,” from “Canada at War Forums”, Canada at War, Jan 2010. When accessed digitally, there is a tendency to forget that artifacts of history belonged to a broader sociocultural context. We must then keep in mind that Wow Comics was not only a product of a consumerist culture, but highly successful ones. During the war, there was a tension between the government’s “anti-spending” propaganda campaign, and the companies that naturally wanted to keep up consumption. Businesses, to protect their success, had to be tactical about their approach to advertising. As Graham Broad puts it in his book A Small Price To Pay, advertisers’ initial response to the war was to maintain a “business as usual approach” (50). However, as the government continued developing their propaganda to align spending with treason (e.g. using Hitler’s image in anti-spending campaigns as seen in Figure 1), advertisers shifted tactics to attaching social significance to their products (Broad 61). To accomplish this, advertisers started constructing the purchase of every commodity as being useful to the war effort (77). In doing so, advertisers inverted the government’s “serve by saving” ideology into a “serve by spending” call to action. As a result, advertisers made consumerism a mode of participation in the war effort, and boosted morale in the lives of Canadians by giving them the sensation that their spending was in some way helping to win the war. Figure 2. Toy gun advertisement. Wow Comics, no. 17, 1943, Bell Features Publishing, pp. 57. Wow Comics fits into the consumer climate in a similar way: by working both as a source of morale and a piece of propaganda. Two advertisements in the back of Wow Comics no. 17 that promote toy guns to its readers serve as an illuminating example. 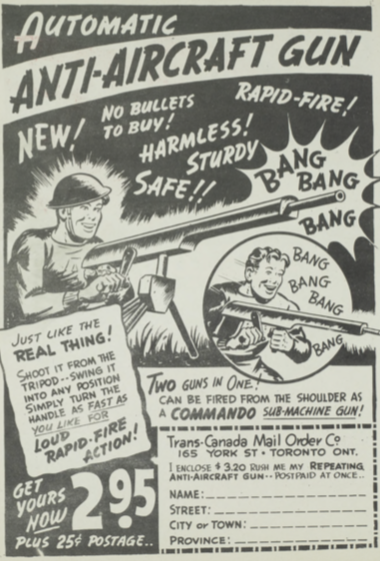 The advertisements invite children to role-play as soldiers with models guns that are “Just like the real thing!” (Wow Comics 57). Margaret Higonnet, doing research on military themes in children’s culture, argues that toys can be used to domesticate war, “[granting] distance and [permitting] us to claim mastery” (“War Toys” 119-120), and we can see such a process taking place here. Purchasing these toy guns would allow children to recreate the battles they hear about in school and read about in these comics, relocating the war into an imaginary space where they have control. In other words, children can use these toy guns to imagine themselves as brave heroes of war. Since we know that toys are often employed by children to help them navigate through uncertain times (“War Toys” 118), this reconfiguration of war allows children to feel better equipped to deal with the changes wartime brought into their lives, and thereby boost morale. The advertisements also work as propaganda, as they encourage children in their play to embody soldiers fighting on the “good side” (i.e. the Canadian military) against evil (i.e. enemies of Canada, Nazis). Rehearsal of war, especially as it is informed by the advertisements and themes found in Wow Comics serves to reproduce the ideological binary of good vs. evil and solidifies the justification of the Canadian war effort. While several of Wow Comics no. 17’s stories are based in the military genre, its representations of war are quite distant from the realities. The front cover of the lets readers know it is filled with action. The cover depicts a German U-Boat being blown up, complete with enemy bodies flung airborne, and crashing waves. In the bottom left corner is a text box that reads “‘The Penguin Strikes’ Plus 5 Other Hair-Raising Features,” advertising that at least six of the contained stories are action packed. Higonnet argues, “One of the paradoxes of war, as it is represented in children’s books, is that battle becomes distilled as individual combat” (2). Her theory applies here: while some of the comic’s stories are situated directly in the war effort, there is never a battlefield full of soldiers or towns under siege. Instead, comics like “The Penguin” take place on a nondescript coastline, with a single protagonist going up against a single German villain, “the Luger” (Wow Comics 3). Similarly, “Whiz Wallace” takes place in India, and has a battle between the protagonists and the villainous “Spymaster” and his henchmen (Wow Comics 19). The comics’ representations of war take place in contained (and due the lack of specificity in location, almost secret) places, where the violence does not reach innocent lives. Such representations reduce war to a singular heroic man seeking out and infallibly beating up singular villains without causing any auxiliary destruction. However, the reality war is far more complex, violent, and senseless than that heroic process. As a scholar on the “White”, Ivan Kocmarek, remarks that the “Canada Whites” were likely one of the only sources of information about the war for children (156), and this representation could therefore be interpreted as a realistic depiction for young readers. Appearing so controlled and one-sided, the war might have then appeared less scary for kids, as it upheld morale about the likelihood of Allied success. The cast of heroes in Wow Comics no. 17 is not what one would expect compared to classic comic heroes such as Superman. Instead of supernatural powers, the Canadian heroes used cunning, detective skills, some weapons, and their fists to dole out justice. They are not superheroes, but vigilantes, spies, and adventurers who fought for good and exhibited bravura in the face of evil. “The Penguin,” shows a lone hero in a penguin mask foiling a Nazi plot to bomb the Canadian coast without ever coming face-to-face with the enemy, merely outsmarting them by placing one of their own bombs in the U-Boat’s periscope (Dingle 5). Beyond the immediate threat of a bombing, the deadly weapon is aptly named the “demoralizer bomb” (Wow Comics 3). The Penguin is therefore not just protecting physical bodies, but also the collective spirit of Canadians, pointing to the importance of morale during wartime. Similarly, the comic “Guy Powers: Secret Agent” shows a Canadian detective uncovering a Nazi sabotage scheme in a Canadian factory. In the end, the hero expertly punches out the Nazi spy when he tries to pull a gun on him after being found out. What this common theme of self-defence reveals is a uniquely Canadian approach to the war where violence is used as a means of defence, as opposed to an all-out offensive means to victory. While these tales openly confess that the home front is always a vulnerable target, they also remind young readers that there will always be heroes that will stop the infiltrating evil before it can cause harm, further providing them with comfort, and maintaining the good vs. evil binary that justifies the war effort. Several of Wow Comics no. 17’s “Hair-Raising Features” take place in a setting outside of WWII. Regardless, they still keep up morale in a similar way to their militaristic counterparts by continuing to reinforce the hero vs. villain binary. As an example, in the comic “The Phantom Rider,” a vigilante hero (The Phantom Rider) rides through the Wild West seeking vengeance against the gun-wielding bandits that killed his father. On his quest, he finds the criminals, but realizes they are planning on stealing a herd of cattle from a local town. The Rider then proceeds to trap the criminals and turn them over to the authorities, saving the day. This comic reinforces the idea that justice is achieved by a clearly good hero fighting against clearly bad villains. When the sheriff says “He never breaks his word, always helps the one in need,” (Wow Comics 35) readers are further reminded that this story is an example of the Rider’s time-proven process. The echoing heroism in the comics that exist outside of the war continue to remind the reader that there are good people who protect the innocent from evil. Figure 3. Panel from “Whiz Wallace” showing the Spymaster. Wow Comics, no. 17, 1943, Bell Features Publishing, pp. 21. Although the Axis powers were generally understood as evil, the brevity of the comic’s stories required their visual representations of evil to be done efficiently. To do this, illustrators of the “Canadian Whites” tended to rely on stereotypical depictions of Canada’s enemies to communicate not only villainy, but also race and nationality. 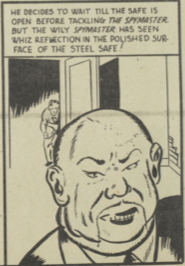 Perhaps the most striking example of this is Thomson’s design of the Japanese villain “The Spymaster” in “Whiz Wallace.” The Spymaster is bald, fat, has slanted eyes, and a fu manchu (Figure 4). Although skin tone is absent in the black and white comics, he is described by one of the white protagonists as a “yellow beast” (Wow Comics 22). Additionally, he possesses a magic that allows him to control the minds of men, and is described as being “mysterious” (Wow Comics 17), ascribing to him a sort of mysticism frequently linked to Asiatic peoples. The combination of both these visual and textual elements construct a portrait of the enemy that is immediately distinguishable to both the protagonists and the readers. This representation shows the “bad guys” as being easy to identify, and in turn, makes them easy for the heroes to find and stop. Children reading these comics might then feel more confident in the understood heroic process when it is demonstrated as being so streamlined and a simple matter of finding the stereotypical villain and swiftly putting a stop to them. Moreover, German villains were constructed in a similar way to the Japanese: by drawing on stereotypes. The Luger in Dingle’s “The Penguin” is the perfectly designed villain: square jaw, bald, scar located on his head, devilish smirk, and even a monocle. In addition to drawing on the familiar white villain tropes, the German accent is transcribed in the dialogue to reify the connection to German nationality (as if the U-Boat and Nazi flag were not enough). “What is the hold-up” thus becomes “Vat iss der hold-up” (Wow Comics 5). Villains, then, can be recognized not only through visual signals, but also aural ones. For the price of 10 cents, Wow Comics offered children worlds parallel to their lived realities where war was not as scary as it seemed. In line with the trends of the era’s consumer culture, Bell Features was successful in turning its products into commodities with social significance in a wartime context. Within these comics, war is reduced to a game of cat and mouse where the hero hunts down and inevitably stops the villain from doing harm. Giving children a more simplistic perspective of war, a complex adult phenomenon, perhaps helped them to feel less afraid during a time of great fear and uncertainty, or at least have a stronger faith in the success of the soldiers fighting for them. Additionally, through advertising, these comics invited children to recreate these war narratives in a way that made them feel in control of their situation. 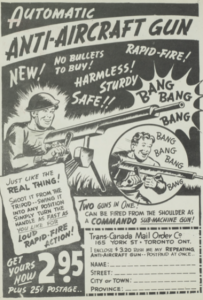 Amid the sea change the Second World War brought to the lives of Canadian children, the Wow Comics fulfilled the important duty of keeping up their morale and fending off fear. Broad, G. A Small Price to Pay: Consumer Culture on the Canadian Home Front, 1939-45. UBC Press, 2013, Vancouver, Canada. Higonnet, M. “War Games.” The Lion and the Unicorn, vol. 22, issue 1, John Hopkins University Press, 1998, Brooklyn, United States. —. “War Toys: Breaking and Remaking in Great War Narratives.” The Lion and the Unicorn, vol. 31, issue 2, John Hopkins University Press, 2007, Baltimore, United States. Kocmarek, I. “Truth, Justice, and the Canadian Way: The War-Time Comics of Bell Features Publications.” Canadian Review of Comparative Literature, vol 43, issue 1, 2016, Canada.